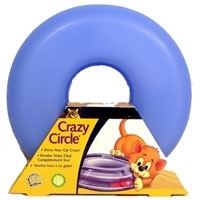 The Crazy Circle® is your cat’s new, favorite toy! This fun-filled, interactive toy features a yellow ball inside an outer, circular track. Your cat will love to bat the inner ball around the circle trying to get it out! Available in large and small sizes.